Clarinetist Sharon Kam was praised “a most imaginative and individual artist” by the “Gramophone” magazine. Her recordings demonstrate her being equally at home with the classical repertoire as with contemporary music and Jazz. Sharon Kam is a native of Israel, where she studied with Eli Eban and Chaim Taub. After her debut with the Israel Philharmonic and Zubin Mehta at the age of 16, she was encouraged and mentored by Isaac stern. Later, she graduated from the Juilliard School Of Music, where she studied with Mr. Charles Neidich. Winner of the 1992 ARD International Competition in Munich, Sharon Kam has performed since with the most renowned orchestras in the USA, Europe and Japan. A lover of chamber music, Ms. Kam regularly collaborates with colleagues as Heinrich Schiff, Christian Tetzlaff, Antje Weithaas, and Tabea Zimmermann. She often plays recitals with pianist Lars Vogt and is a regular guest at his festival ‘Spannungen’ in Heimbach, Germany, as well as other festivals like Verbier, Risør, Cork and Delft. Her collaboration with pianist Itamar Golan has been acclaimed by critics and audiences alike for over a decade. Last season she performed in the Concertgebouw Amsterdam Together with Enrico Pace and Daniel Müller-Schott, a collaboration which will continue into the next season. On the occasion of W. A. Mozart’s 250th Anniversary Ms. Kam performed a live television broadcast (in 33 countries) of the Mozart clarinet concerto from the Estates Theatre in Prague. Her highly acclaimed recent release of Mozart’s clarinet quintet and concerto, together with Isabelle van Keulen, Ulrike-Anima Mathé, Volker Jacobsen und Gustav Rivinius and the Haydn Philharmonie fulfilled her dream to record these two pieces on the Basset-Clarinet. 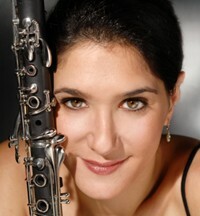 Sharon Kam received the Eco prize as ‚instrumentalist of the year’ for two recordings: Her recording of Weber concertos with Kurt Masur and the Gewandhaus Orchestra of Leipzig (Teldec); and her CD with the Leipzig Radio orchestra, including works by Spohr, Weber, Rossini and Mendelssohn (Edel Classics). Her CD ‘American Classics’ with the London Symphony Orchestra, conducted by her husband Gregor Bühl, was awarded the prize of the “Deutsche Schallplattenkritik”. Under Edel Classics she released a CD with works by Rietz, Bruch (with her brother Ori Kam) and Weber, the CD “Souvenirs” (with Itamar Golan) and “Brahms – Sonatas & Trio” (with Martin Helchen and Gustav Rivinius). Ms. Kam has premiered numerous contemporary works, including Krzysztof Penderecki’s Clarinet Concerto and Quartet and Peter Ruzicka’s Clarinet Concerto „Erinnerung”. In Summer 2006 she premiered Herbert Willi’s clarinet concerto at the Salzburg Festival. This season she will premiere the Eröd clairnet concerto with the Tonkünstler-Orchester in the Musikverein Viena. The 2011/12 Season brings Ms. Kam to venues such as the Laeiszhalle Hamburg, the Philharmonie Berlin, the Alten Oper Frankfurt, the Konzerthaus Berlin, the Kölner Philharmonie, and the Schleswig-Holstein-Festival. She will join the Royal Philharmonic Orchestra on tour through Germany and Austria and perform recitals trough South Korea.